Greetings to everyone from River Run Guide Service. 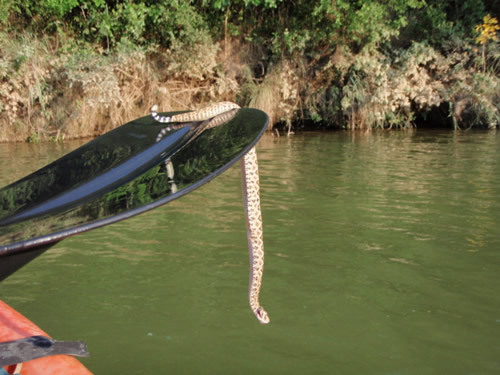 In 20 years of fishing the Middle/Upper Brazos River, I can honestly say that I have never encountered a venomous snake (pit viper) within the riverbed. However, as I tell my clients, go outside the riverbed and that can be a very different story. 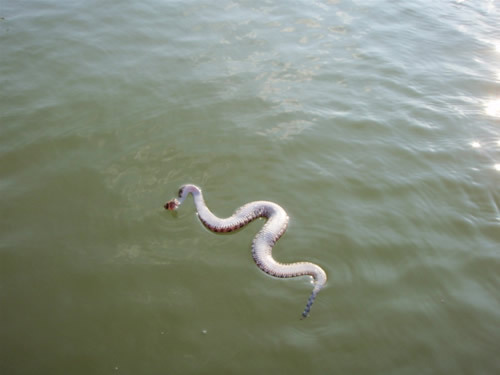 Obviously, just because I have never come accross a venomous snake in the river, does not in any way mean they are not there. In fact, I always remain vigilant and on the lookout knowing that I'm simply overdue for my first encounter. The way I look at it, Texas, venomous snakes and the outdoors will always go hand in hand. 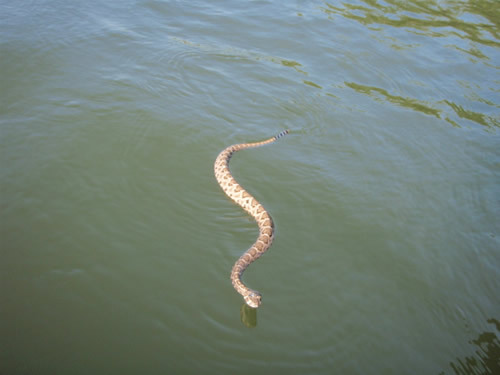 So, I wasn't too suprised when I observed a juvenile rattlesnake headed accross the river while I was in my kayak flipping a jig for bass. I continue fishing. 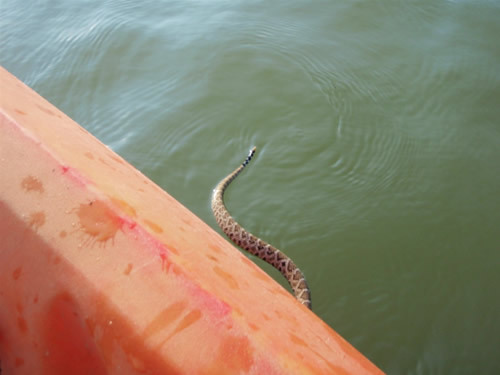 However, I can't help to notice the rattler has changed it's course and is headed straight for my kayak. At this point, I've pretty much quit fishing and have my attention focused on the intentions of this potentially pesky pit viper. 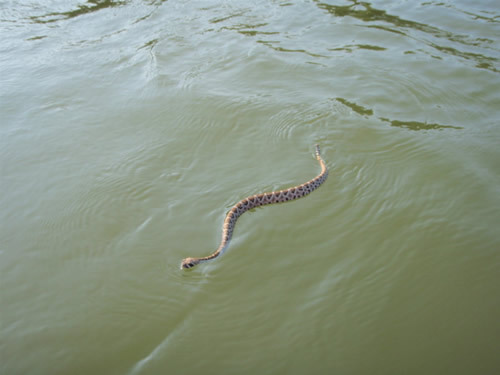 While tracking the rattler's movement, I couldn't help but think, from a fish's point of view, how enticing the serpentine motion of this snake looked while in the water. 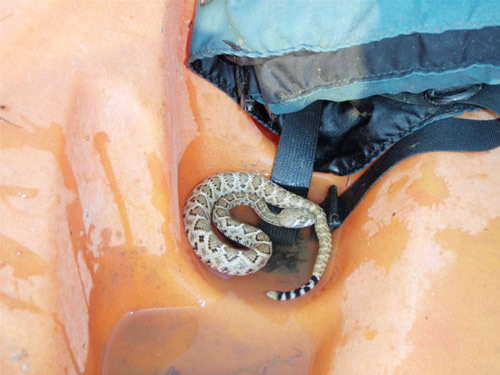 Suddenly, I am jolted back to reality by the fact the rattler is now along side my kayak and is lifting it's head out of the water in an apparent attempt to come aboard. 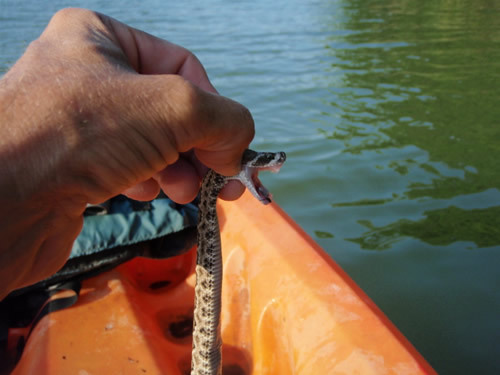 No way I'm having this ill intentioned reptilian hitchhiker nosing around the kayak. So, with a couple whacks of the paddle, it's now docile as can be. This rattler looks like mighty good big bass bait!!! I put him in one of the footwells on the kayak and paddle over to a series of submerged river laydowns so I can begin to put my plan into action. Here is my "Superstar" getting warmed up in the bullpen. I now cautiously rig the snake by hooking it through the bottom of the jaw and through the top of the head onto a weedless black 3/4 oz. jig. On my sixth cast into the snag infested laydown my jig n snake combo gets destroyed on the fall as indicated by a telltale "thump" that reverberates all the way down my rod blank. I set the hook hard and immediately feel stiff resistance on the other end from what I know is a solid fish. What happens next is something I'll likely never forget as I watch my bass come cartwheeling out of the water with the rattler hanging out of it's mouth! The LMB gave a really good account of itself and I eventually get her alongside the kayak. I cautiously lip the opposite side of the cavernous mouth where the fish is hooked. 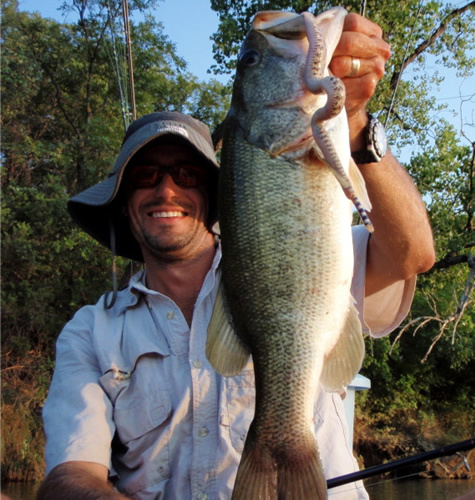 I now take a moment to pose with my oversize snake eating river bass before returning her back into the river depths. I admit, my curiosity might have gotten the best of me on this one. However, I just couldn't help it. 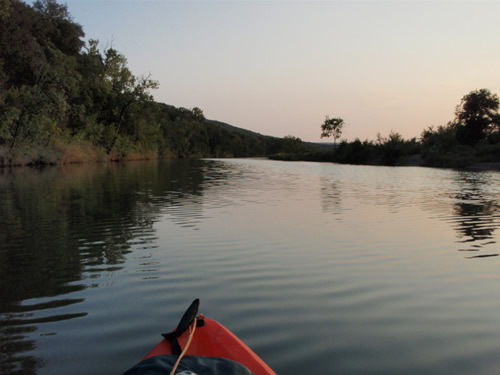 It was just another Kayak Fishing Adventure on the Brazos River, TX.